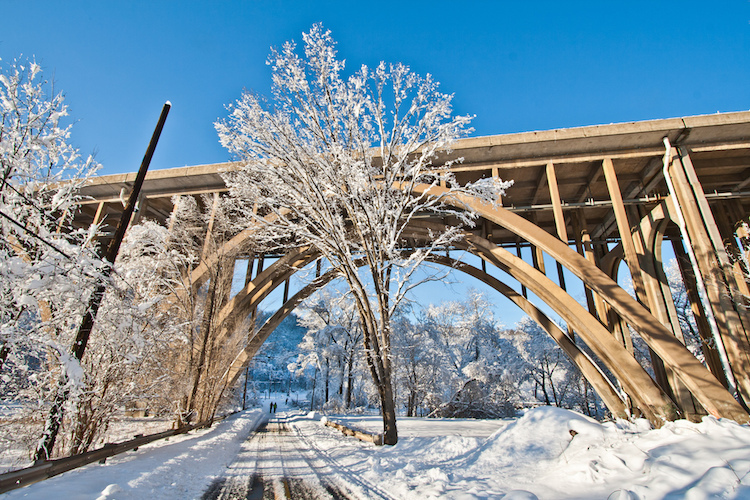 Pittsburgh bridge in winter. Image via Jason Pratt / Flickr. It’s shaping up to be a historically rainy autumn, and winter isn’t far away. For the nearly 20 percent of Pittsburghers who live at or below the poverty line, keeping themselves and their families warm can be a struggle. Fortunately, local organizations help by gathering warm clothing and coats from Pittsburghers who have plenty and sharing those items with those who do not. Below, we have a roundup of six fine organizations that are currently or will soon be accepting winter coat donations for underserved families and communities. Keep them in mind as you start taking your winter wear out of storage. It gets cold in this city; we have to stick together for warmth. This interfaith organization grew out of community efforts to help victims of flooding in the North Hills after a powerful storm in 1986. Since then, they’ve grown to provide everything from a food pantry and help with tax prep to refugee resettlement in the suburbs north of the city. The group is currently accepting winter coats that will be distributed at three free stores around the North Hills. But their deadline of October 12 is coming soon. Coats can be donated to NHCO’s Allison Park office from 9 a.m. to 4 p.m. Monday through Friday, or by calling 412-487-6316 (ext. 1) to set up a time outside of business hours. This 116-year old charity organization has dozens of locations currently accepting winter coats and other donations of clothing all over Allegheny County. In addition to providing affordable winter clothes, Goodwill’s network of independent community organizations also provides support and job training to veterans and struggling families. They accept donations year-round. These famous bell ringers are currently accepting donations at both their own offices and through local partners around the Pittsburgh region. All used coats are welcome, but if the idea of giving a child a brand new coat this winter is appealing, check out the Salvation Army’s Project Bundle-Up. It began as a small charity event several years ago. Today, the Free Store 15104 is an anchor for the Braddock community. Working from a pool and individual and group donations, the store provides clothing and some food to the residents of Braddock. The store is the brainchild of Gisele Fetterman, who also co-founded 412 Food Rescue. It’s a great place to drop off donations of warm winter coats. Free Store Wilkinsburg. Photo by Greg Sciulli. This shop was inspired by, and often collaborates with, the Free Store in Braddock. 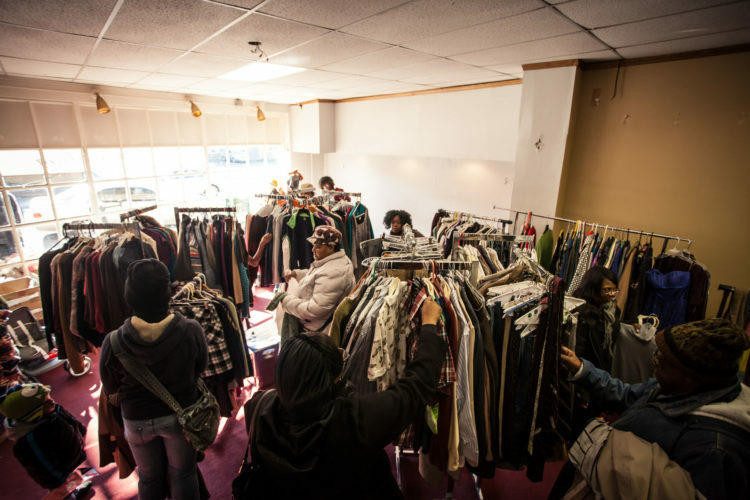 Located at 619 Penn Avenue, this shop is currently accepting donations of winter clothing, as well as school supplies and small home appliances. 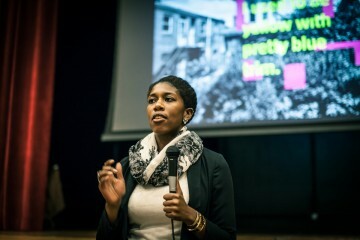 This annual event serves youths and families in Pittsburgh’s East End. Lightly used coats can be donated at EECM’s Community House located at 6140 Station Street in East Liberty. To help ensure quality, the ministry has partnered with the family-owned and Pittsburgh-based Strong II Dry Cleaners. From Oct. 1 through 19, Strong II Dry cleaners will launder used coats for free — just drop them off and let Strong II know they’re for the coat drive. More details about the event will be announced on EECM’s website in the coming weeks.